Very important tips when selecting an IWB holster. THE HOLSTER SHOULD NOT CARRY ANY TYPE OF INSURANCE FOR THE RETENTION AND EXTRACTION OF THE WEAPON, SINCE IN THOSE IMPORTANT AND FAST MOMENTS YOU CAN FORGET TO REMOVE THE RETENTION STRAPS, OR ANY OTHER KIND OF SECURITY OF THE HOLSTER AND IT CAN COST THE LIFE (THAT'S WHY WEAPONS DON'T HAVE ANY KIND OF DISCONNECTION SECURITY OR LEVER). Also, what you wear is very important to carry a weapon, because nobody would noticed that you are carrying a gun, that is one of the most important tip of self-defense. Remember that you should be comfortable carrying the Holster. Durability and good material to protect your weapon. BLACK SCORPION GEAR is the pioneer in competition Shooting and our Team designed an economic Holster with many beneficial features. FITS MOST: Right handed Springfield XDS / Sig P365,P320c / Glock 26,27,19, 23, 42, 43 / Beretta PX4 / Shield S&W / Ruger LC9 / Taurus G2 Millennium & All Similar Handguns. THE BEST GRADE MATERIAL: We used the strongest materials available; 1680 D, The interior of the holster is made of a soft material, anti-sweat material to protect your weapon our extremely strong Steel belt clip for belts width 1.6 inches. Do not accept imitations. 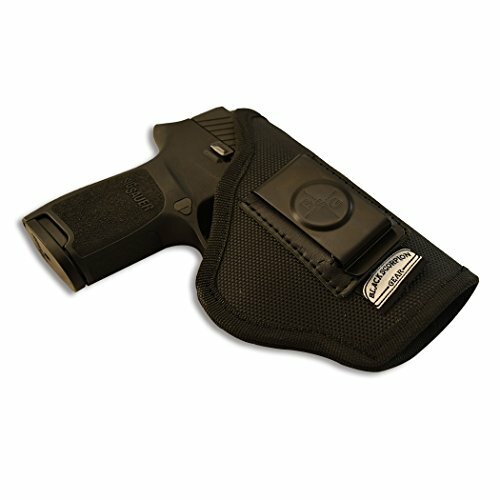 Comfortable holster designed for concealed gun carry, with solid steel belt clip. It is made from breathable 3D material, with durable lining. It has an extended sleeve in the back, which separates gun from the body. GUARANTEED : 100% Money Back Guarantee. .Lifetime Warranty, no questions.